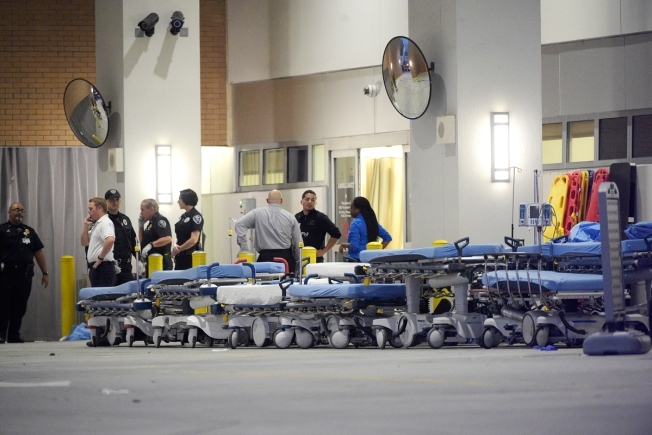 Emergency personnel wait with stretchers at the emergency entrance to Orlando Regional Medical Center hospital for the arrival of patients from the scene of a fatal shooting at Pulse Orlando nightclub in Orlando, Fla., Sunday, June 12, 2016. Families and friends waited outside an Orlando hospital Sunday anxious to hear about their loved ones following the shooting. Police said 49 people were killed and 53 others were wounded at Pulse Nightclub, in what is the worst mass shooting in U.S. history. The shooter was identified as Omar Mateen, 29, a resident of Port St. Lucie, Florida. Christine Leinonen, who waited outside Orlando Regional Medical Center hospital, said she drove to Orlando at 4 a.m. when she hadn't heard from her son, Christoper Leinonen, 32. "These are nonsensical killings of our children. They're killing our babies!" she said, fearing the worst for her missing son. Leinonen said her son's friend made it out alive by hiding in the bathroom and running out as bullets were flying. 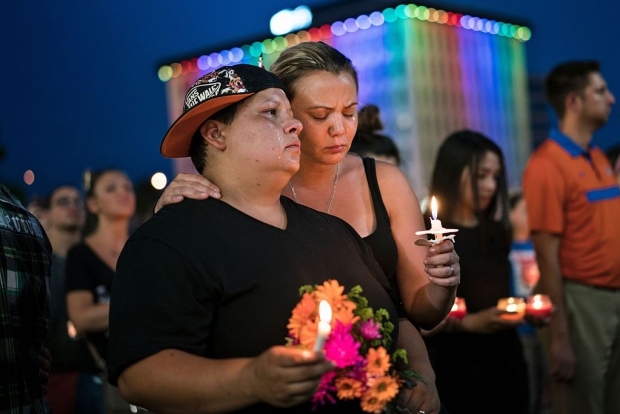 The City of Orlando began to release the names of some of the victims of Sunday's deadly mass shooting at a popular night club. Seven of the victims were identified on the city's website: Edward Sotomayor Jr., Stanley Almodovar III, Luis Omar Ocasio-Capo and Juan Ramon Guerrero, Eric Ivan Ortiz-Rivera, Peter O. Gonzalez-Cruz,Luis S. Vielma. Mina Justice was outside the dance club early Sunday, trying to contact her 30-year-old son, Eddie. He had texted her that he ran into a bathroom after the gunfire erupted and asked her to call police, then texted: "He's coming." Many of the injured were critically injured and were being operated on, according to Michael Cheatman from the Orlando Regional Medical Center. Fatriana Evans frequents the club and was outside when shots were fired: "It sounded like fireworks — pop, pop, pop — and then everybody scatters." Jackie Smith, who was inside the club, said two friends next to her were shot. She said she hasn't gotten updates on their conditions. She came out of the hospital and burst into tears in the arms of friends. "Some guy walked in and started shooting everybody." she said. "He had an automatic rifle, so nobody stood a chance. I just tried to get out of there." Facebook added a "Facebook Safety Check" Sunday morning for people to find out whether friends and family have tagged themselves as safe. The social network is using the heading "The Shooting in Orlando, Florida." A hotline has been set up for families of the victims to call: 407-246-4357.